NEW YORK (Zap2it) -- It takes a lot to excite cynical New Yorkers - they've been there and done that - twice. So it takes even more to whip them into a frenzy. 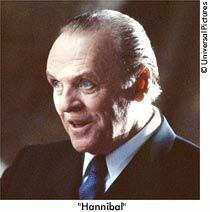 But when Sir Anthony Hopkins unexpectedly showed up at Manhattan's Ziegfeld Theatre for a screening of "Red Dragon," in which he reprises his Oscar-award winning role of Hannibal Lecter, absolute mayhem ensued. It was a rare New York moment. 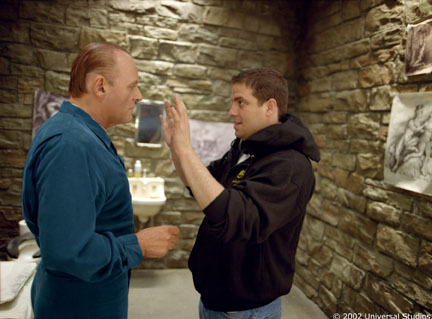 "Red Dragon" screenwriter Ted Tally sets the scene: "We were having dinner across the street - Tony Hopkins, [director] Brett Ratner, Harvey Keitel [Jack Crawford] - and Brett suggested that we go over and watch the last five minutes. [When the movie was over], we were racing through the street and Tony couldn't get to the car before he was mobbed. It was a weird scene. It was like he was a rock star. People were shouting and trying to touch him, cheering and applauding and blocking traffic. It was like Mick Jagger was there or something. It was amazing." And Hopkins was good spirited about the attention. "He never turns anybody away," Tally continues. "He never refuses to give an autograph. He's infinitely charming. I guess that happens everywhere he goes, but I had never seen anything like it." His beverage of choice isn't Chianti, it's tea, and he fiddles with the cup as he talks. In fact, the only similarity between the men are Hopkins' piercing blue eyes, which glisten brightly in the morning light that streams through the windows of Manhattan's Rihga Royal Hotel. Over tea, Hopkins spills his thoughts on "having an old friend" back onscreen. ZAP2IT: You met your public last night. HOPKINS: We were out for dinner and Dino [De Laurentiis, producer] said (imitating his De Laurentiis' Italian accent), "Let's a go to dee theater to see dee end of the film." So we went. I was astounded by the audience's reaction. Dino, Brett and Ralph [Fiennes, Francis Dolarhyde] had seen it the night before, but that was my first experience with an audience. ZAP2IT: At this point you need to be good-natured about the attention you receive for portraying Hannibal. The jokes about Chianti, fava beans? HOPKINS: Oh, yea. (nods) I've been living with it now for about 12 years. I sometimes remind them that I have done other films besides this. ZAP2IT: Was there any reluctance on your part to do this role again? HOPKINS: I did wonder who would play Hannibal if I didn't. (laughs) But, no, I didn't have any terrible reservations about it. I just had a few questions. The biggest: Why make another one? That was all. ZAP2IT: What did you think about working with Brett Ratner, who is known for his Jackie Chan movies (the "Rush Hour" series)? ZAP2IT: Had you seen any of the "Rush Hour" movies? HOPKINS: No, I hadn't seen "Rush Hour," but I went to see it. I thought: How is Brett Ratner going to do this one because that one was such a spoof? Though Jackie Chan was very enjoyable. Then, last year I met Brett in New York. We talked and he was trying to sell me on the movie. I didn't need much persuading, but I wanted to ask a few questions. HOPKINS: I wasn't too happy with the opening of the script. It was a bit grisly, and I thought it was unnecessary. They said that they would cut down on that. Then I said, "I'd love to do it, but I'd like to play him differently this time. I don't want to play him with that cutesy charm." I didn't want to do a parody, which I'm afraid Hannibal was in the last one ("Hannibal"). Brett asked how I'd like to play him and I said, "More dangerous and much more menacing." I wanted to play him with blazing anger and rage. So I'm grateful to Brett because he helped me do that. ZAP2IT: Do you think it's risky to play the same character three times? HOPKINS: I do. But it's only a movie after all; it's not life or death. Is it risky? No, nothing's risky. But it costs a lot of money to make a movie, so you have to be sure that you want to do it. There is a franchise in Hannibal Lecter, I guess. But I'm really quite detached from it all. I always have been. HOPKINS: I remember when "Silence of the Lambs" came out. It was about to be released, and there was a big buzz about it. Somebody phoned me and told me that there was a huge billboard of me on Sunset Boulevard [in Los Angeles]. So I drove over and looked at it. As I sat there in the car, I thought: Well, there I am. How does it feel? No different from anything else. You get on your with your life. I've always been detached from this. People talk about this film? I don't know if it's going to be a success, but it seems to be going that way. It's a fine movie and I'm glad. I'm very glad for Brett Ratner. I'm glad for all of it. But I'm still removed from it. Because I'm not Hannibal Lecter, I'm just an actor who plays him. ZAP2IT: I've read that when you're traveling across the country you're often recognized as "Hannibal Lecter." Is it strange to be associated with such an evil character? HOPKINS: It wouldn't stop everyone. People wouldn't have me arrested or anything like that. (laughs) Sometimes I'm prepared to answer to, "Oh, my God! You're Hannibal Lecter." I say, "No, I'm Anthony Hopkins." But that doesn't happen too much. It's a bit of an exaggeration that people blow out of proportion. I just live my life normally. It was printed in some British tabloid that I have become Hannibal Lecter. (laughs) I live my life; I live a very quiet life. I'm not a connoisseur of wine. I'm nothing like this character. But I'm nothing like any of the characters I play. ZAP2IT: There are large gaps of time in between Thomas Harris' books: 1981, 1988 and 1999. Do you feel a sadness that we may never see Hannibal again? HOPKINS: I don't think Tom would write another one, though he has seen this movie and really liked it. He may be tempted to do another one, but I don't think it can take four. HOPKINS: --another era. He's an interesting man. He's unstoppable. His willpower toward making a movie. He's very direct, and he's always on the set every day keeping an eye on everyone. Everyone likes him. Everyone respects him. I've known him for many years actually. He's part of the old school, and it shows because he's tenacious. He's a big-hearted man as well as a businessman. ZAP2IT: Playing a younger Hannibal did you do anything special to prepare yourself physically for the role? HOPKINS: I worked out a lot. I had a trainer. I worked out very hard on the Stairmaster and treadmill -- about an hour, sometimes an hour and a half, every day. And this trainer would come to me three times a week. I would do weights and all that. Then I was on a carbohydrate diet. I'd have a terrible diet of pretzels for lunch, maybe half a grapefruit. Then I would be allowed to have something really great: I could have turkey sandwich on Wednesday. I longed for Wednesday. Then I'd work out in the night. I was a little bit obsessive about it. I still work out. ZAP2IT: Did you watch the original screen adaptation of "Red Dragon," "Manhunter"? 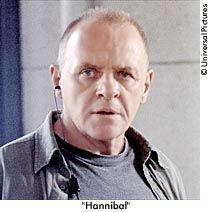 HOPKINS: A long time ago before I even knew about "Silence of the Lambs," I saw "Manhunter" in London. I thought it was a good movie. I remember the chair, the wheelchair burning. That was really scary. Then, I read the book, but I had no idea about "The Silence of the Lambs" at that time. So when my agent phoned me about " Silence of the Lambs," I didn't put the two together. ZAP2IT: Are you a fan of scary movies? HOPKINS: I am. I enjoyed "Psycho." I enjoy those slow-burners like "Rear Window." I like Hitchcock. I like a lot of movies. I'm not a great movie buff though. I used to be with all the old movies, but I got a bit lazy. ZAP2IT: What can you tell us about "The Human Stain"? HOPKINS: I don't really want to talk about it because I don't know too much about it. We did finish it, and I'm told that it's a good movie. It was certainly pleasant working with Nicole Kidman. Robert Benton was a good director. Gary Sinise is in it and Ed Harris. It's a good cast. ZAP2IT: There's been talk about a "Mask of Zorro" remake. Are you interested? ZAP2IT: Are there any films that you regret doing? ZAP2IT: How do you deal with that? HOPKINS: I don't regret them. Could I have avoided them? Yes. But I don't regret them because you just pick yourself up after them and move on. There are a number of them. ZAP2IT: So, you've played Hannibal three times. Can you tell us what makes him tick? HOPKINS: I have no idea. I can't even get into that; I don't have the time. I just have an instinct about the characters I play. That's all I can go on. I'm not an intellect by any stretch of the imagination. But I sensed that Lecter would become this sort of phenomenon. I don't mean phenomenon in a big way, but I thought that he would have this kind of an effect on the audience way back when I did "Silence of the Lambs." I can't explain why I knew that. ZAP2IT: Are you a man of faith? HOPKINS: I believe in some power. I have to because my life certainly has been an extraordinary life. I haven't been able to figure any of it out. I'm fortunate and blessed. I started off as a child with nothing very much. I was the only child of my parents, they were good parents, but at school I just didn't know what time of day it was. I was very driven by anger I suppose. I was a child and maybe dyslexic or suffering from some educational disability. You feel lonely and you feel angry. So I got very ambitious to be in this profession. I came to the acting business by sheer accident. And so the years have gone by and I always have that shadowy fear of being a fraudulent. But I have no regrets about it. This is life.